If HellForLeather is to be believed, then they have got their hands on what seems like a road map of KTM's North America's future stable. Even though HFL calls it a leaked image, it looks more like a picked image from a hand held device. But who cares, the 2012-2014 North American road map of KTM looks pretty interesting. One of the most notable highlights of the list is the inclusion of the Duke 350, which confirms ThrottleQuest's news. 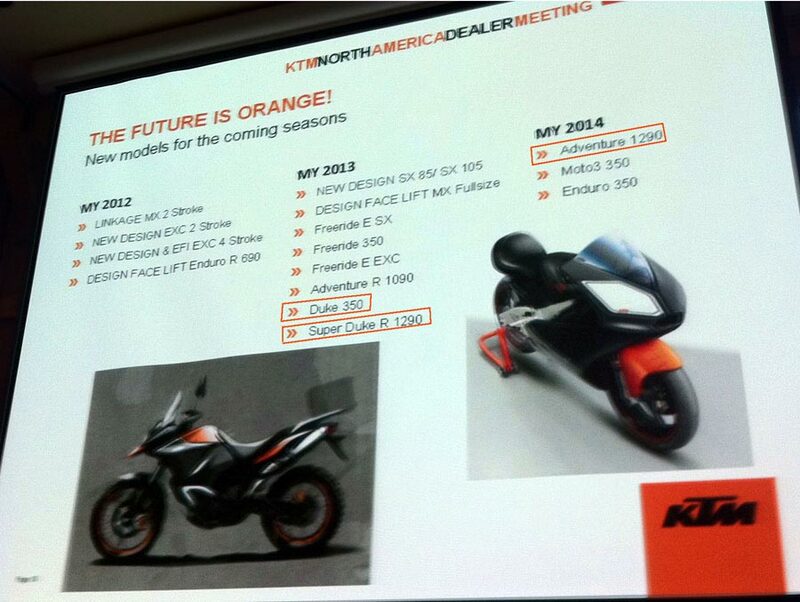 It looks like KTM is also working on a new 1290cc platform for 2014 and also under the Super Duke R flagship for 2013. A closer look reveals the introduction of a new platform by the name Freeride, which definitely looks promising with it's 3 variants, one of which being a 350. For the year 2014 KTM would also bring it's Moto 3 350cc platform to production (pretty exciting I would say). It can be easily estimated from this road map that, KTM is trying to step up the game and be more main-stream than remain on the adventure segment, with major emphasis being given on the 350cc engine capacity. As for this so called "leaked" image, I'm definitely seeing some raised eyebrows in KTM.